When it comes to sausages, homemade is still the best. 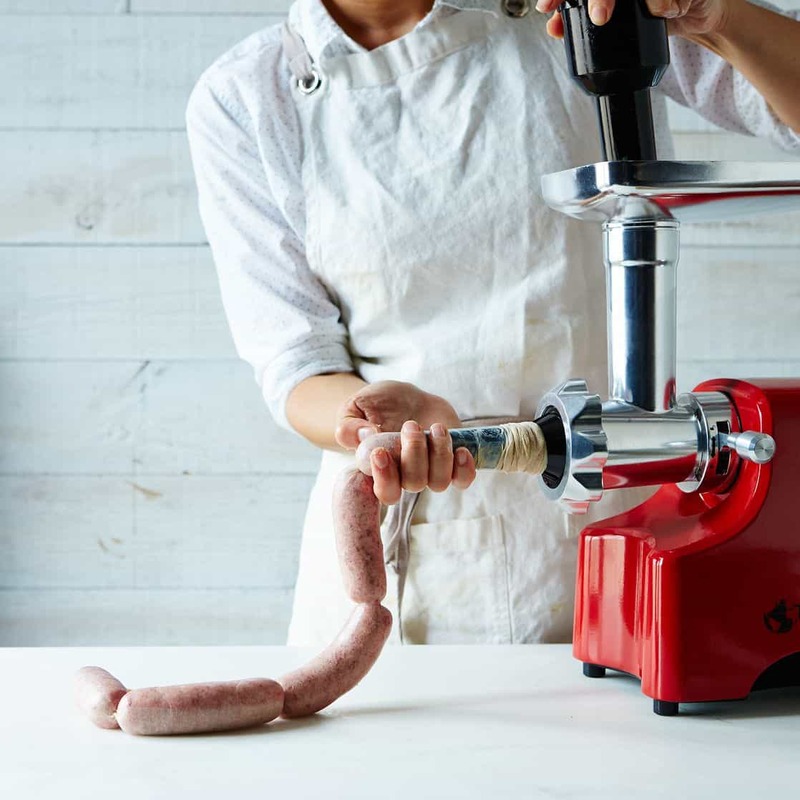 If you’ve been dreaming of making your own sweet Italian sausage, Rapini sausage or Hurka sausage, then you’re going to need the best sausage stuffer. You’ll save a good deal of time and frustration when you have a machine that neatly packages all that delicious flavor into one convenient and natural casing. Here we have 5 best sausage stuffers for you to choose. These machines work on a basic concept. You put the seasoned meat in a canister, and the piston will force smaller amounts down into a special cylinder where your casing awaits. When choosing a stuffer for your home, you’ll want to look for certain features to ensure that your unit is a breeze to use and can make this chore more enjoyable. You’re going to get meat and seasonings all over the stuffer, including the handle and exterior. This is why it’s preferable to go with stainless steel components. The food is less likely to stick, and you'll be able to clean everything off in record time and move on to your next task. You can check out this ﻿in﻿struction﻿﻿﻿a﻿﻿l vi﻿﻿d﻿﻿eo to get a closer look at the components and learn how the machines basically work. 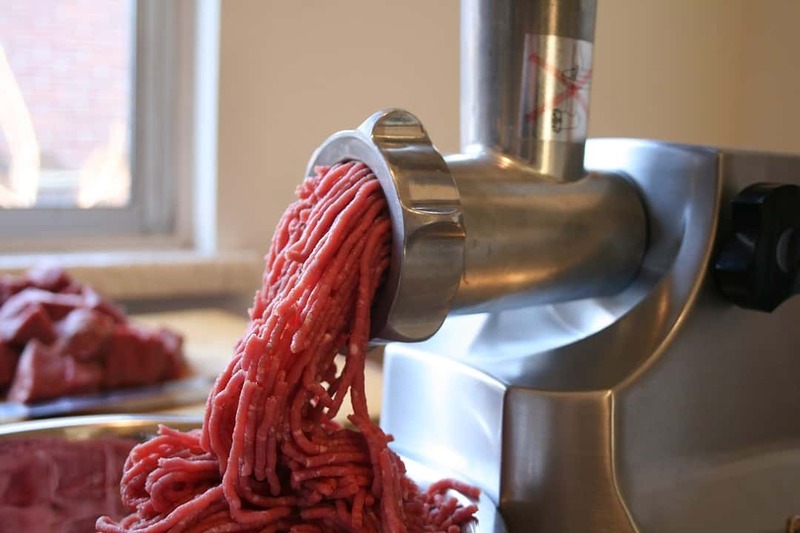 Some stuffers actually feature different speeds, and this can make a big difference when you’re working with a large batch of meat. If you’re new to the art, you may want to start with the slower speed, but you’ll get the hang of the device pretty quickly. You’ll then want to kick it up a notch. The great thing about the air-release valve is that it allows the trapped air in your sausage to escape through the top. Otherwise, you’ll be constantly frustrated by casings that just break apart in the tube. I’ve worked with stuffers that don’t have this feature, and I hated struggling with them. Once I made the switch, I wound up spending less time backing up the piston and more time making delicious sausage. It’s easier to grind meat that’s cold, so keep your large pile in the refrigerator and work with a little bit at a time. Ideally, the edges of your meat should be hard to the touch without being frozen through. Spread your meat out on a cookie sheet, cover it with plastic and then leave it in the freezer for a few hours. 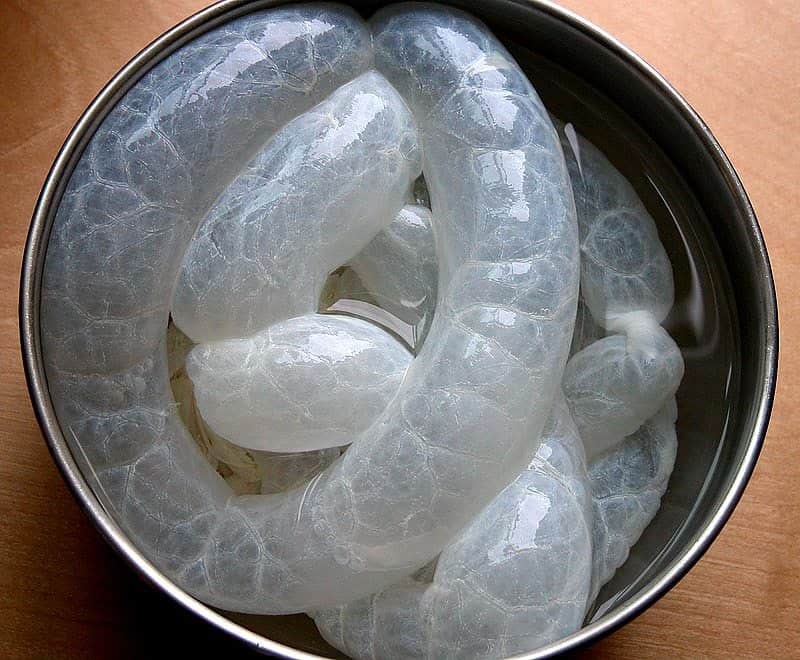 This will help preserve the cell structure and make your sausage flavorful and juicy. The grinder should also be a little on the cold side, so you may want to set it in the freezer for about an hour before you start the batch. If you’re going to use a stuffer for making the sausage, you'll want the meat to be on the warmer side. Meat that is at or close to room temperature will move smoothly through the tube without getting hung up on the piston. If you’re making small breakfast links, you may need to add a little water to the mix. This will thin it down enough and allow the stuffer to easily force it into the casings. 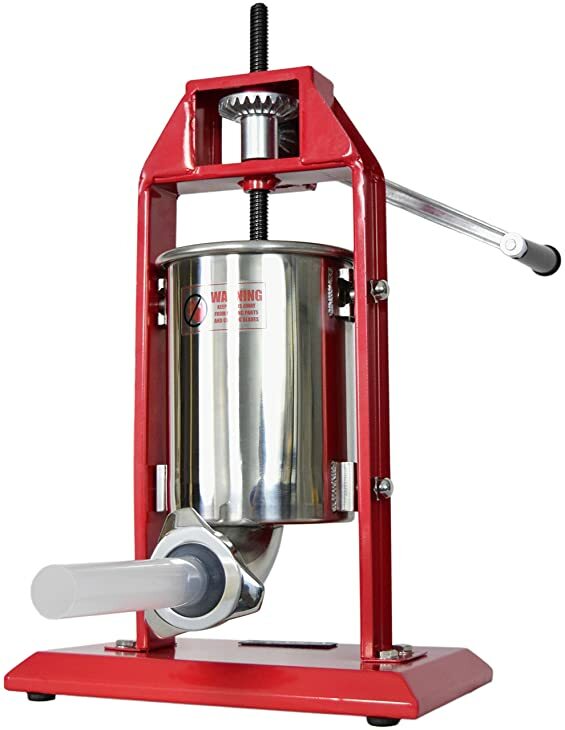 Mixes that are too thick will bog down and require more pressure to get them into the cylinder, and this can lead to blowouts and a major mess. The casing is an important part of your sausage, so you don’t want to skimp on this ingredient. Spend the extra money for all-natural, high-quality casings. They’ll hold up better in the tube, and they can even add to the flavor of your sausage. Once you have your meat mixed together, you’ll need to load it into the primary canister. Some models have a tilt feature so that you can easily scoop everything into the cylinder. You’re going to need to put your stuffer on a stable base so that it won’t rock around when you’re loading the casings. Some stuffers come with pre-drilled holes so that you can permanently mount them to a base, or you may find a model with clamps that will hold it to the counter. Regardless of the attachment mechanism, be sure that your stuffer will remain solidly upright before you start working on a large order. I love eating homemade sausage, but filling the casings can be a pain. That’s why I decided to make the investment in my own sausage stuffer. I love the LEM system because it’s so easy to use that stuffing the casings is actually fun. I know it’s hard to believe, but I was actually a little sad when I ran out of meat. One thing I’m always concerned about with kitchen appliances is cleaning them. There’s nothing worse than struggling to get that last little piece of meat out of a piston or the lower corner. 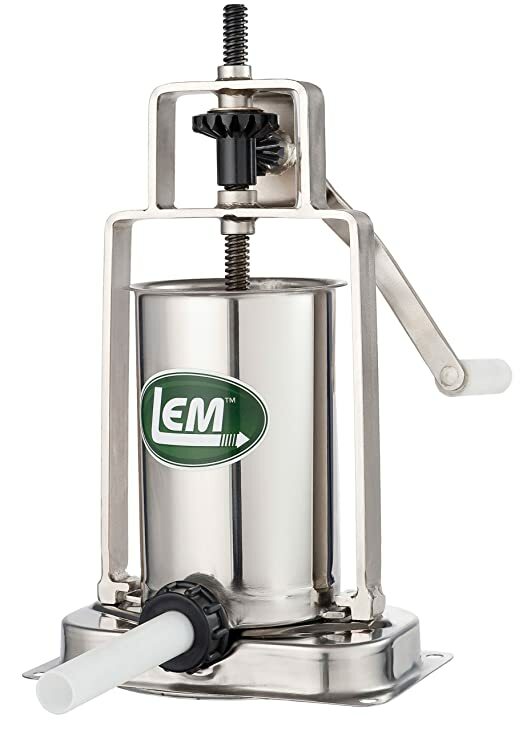 However, the LEM is so easy to clean because it has removable parts that you can soak and scrub. It also comes with three different sizes of stuffing tubes, so you can make everything from skinny little breakfast links to huge sausages for cooking out. 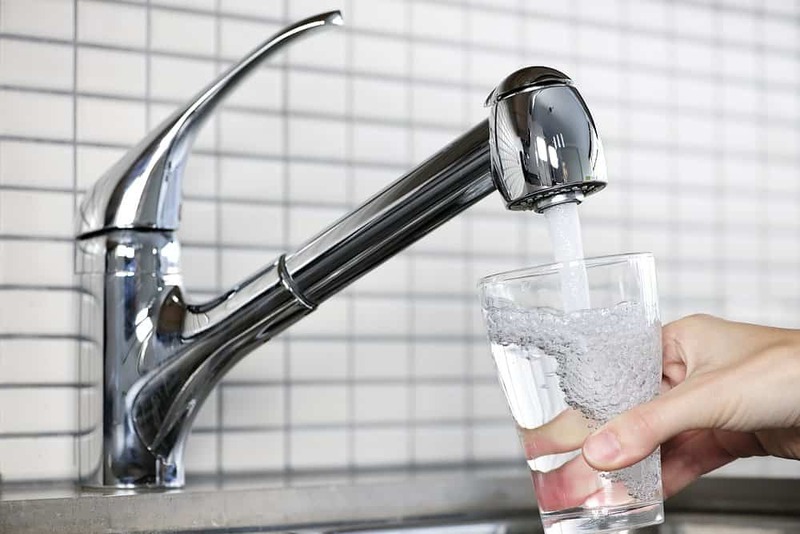 It has an air-release valve for easier filling. The all-metal gears are designed to last longer than plastic. It comes with half-inch, three-quarters of an inch, and 1-inch stuffing tubes. The operation is fast, smooth and consistent. You may need to experiment with the tension in order to find the right level. This system is so impressive because it’s durable and portable. While other machines need to be bolted to a table or to a piece of wood, this one can be clamped directly to your countertop. 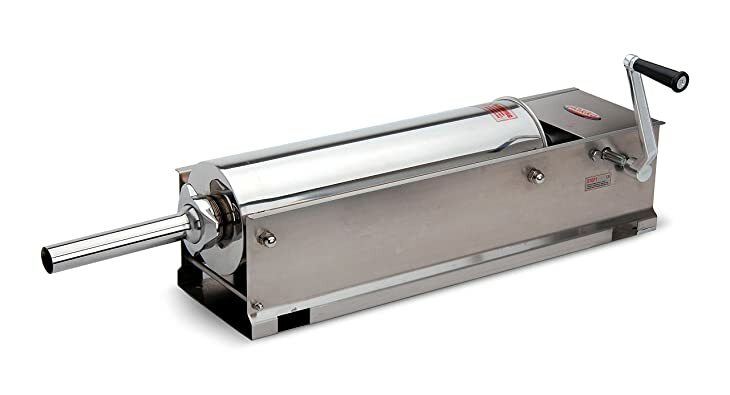 It’s also designed so that the cylinder can be slipped out for a more thorough cleaning, and the plastic piston comes with an air-release valve that makes sausage stuffing more enjoyable.I love that the entire unit, including the metal gears, is built with stainless steel. I only tested a small batch of breakfast sausage with it, but there were absolutely no issues, and I’m confident that it could easily handle all of my holiday stuffing. I made some smoked garlic and cheese sausage that normally cause a stuffer to be hard to clean, but everything came right out, thanks to the steel components. It can handle anything from small to large batches. It fills the casings quickly to help you save time. Very little meat is wasted in the tube. The piston fits tightly into the canister, so you won’t have any meat coming up or around it. It’s one of the more expensive stuffers. When my friends and I decided to get together and make a large batch of spicy sausage to sell at a local fundraiser, I was able to use this traditional vertical machine. I was impressed with how smoothly it operated, and both speeds were a breeze to use. When I was cleaning it, I noted that all the components are made with SGS food hygiene standard metals, and that made cleanup a snap. One thing I loved was the air-release valve that brought excess air up through the top rather than blowing out the bottom of my casings. The system was nice and stable, so we could keep working without having to make any adjustments. I trust that it will last a long time because it has hardened resin gears that look and feel very sturdy. 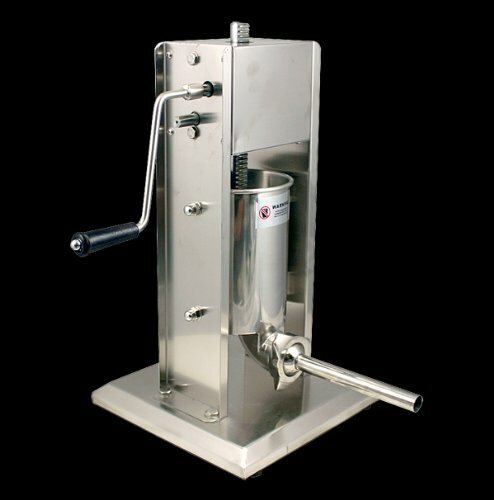 This sausage stuffer is solidly built with secure welds. The air-check valve prevents blowouts and allows for faster operation. It’s easy to load your meat by just raising the plunger and tilting the tub. It was lubricated a little too well at the factory, so machine oil had to be cleaned off before it could be used. Most of the sausage stuffers I’ve tried out are vertical, but the horizontal design of the Hakka caught my eye. It features two speeds, so you can find your groove in the lower speed and then bump it up for maximum production. I read that this system could plow through large amounts in record time, so I put it to the test with about 75 pounds of sausage.After easily stuffing all of the sausages with no problems, I just popped them in the freezer to use when needed. One thing I learned the hard way though, is that you have to keep the system moving once you start stuffing a sausage. I released the handle in the middle of stuffing, and the unit quickly spun counter to me. Overall, however, the stuffer was very easy to use and handled the large amount that I was working with. The two-speed gears allow for more versatile food preparations. The included metal gears felt very sturdy and durable. The system with its stainless steel components is easy to clean. There is no reverse lock, so you cannot let go of the handle. It does leave a fair amount of meat in the cavity. I’m known for my seasonal sausage, so I need to be able to turn out links in a short period of time. When my family members are waiting for amazing apple sausage in the fall or they want to try out a special cranberry taste for their Christmas breakfast, I need to be able to quickly move sausage through the machine and clean it between uses. 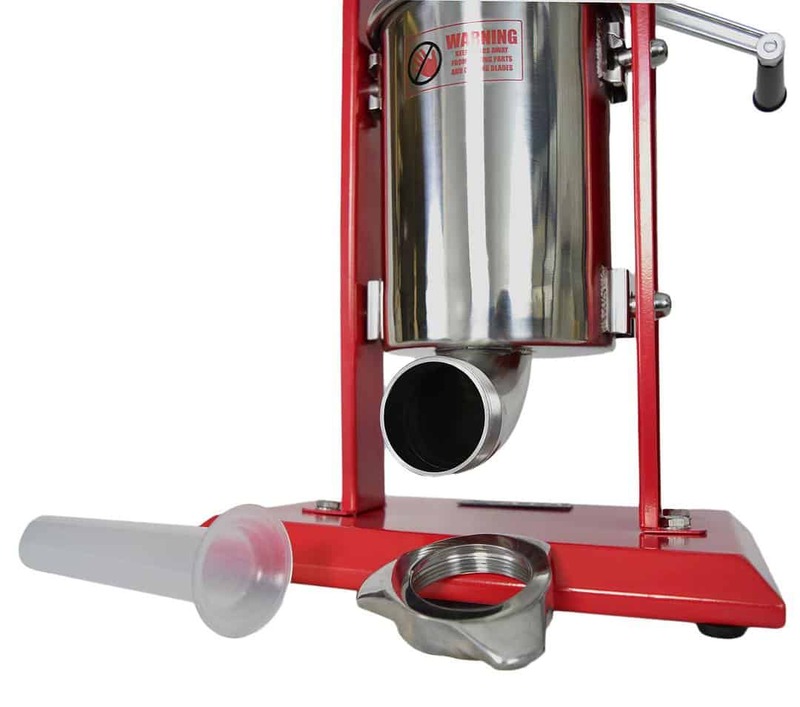 The MTN was perfect for me because it’s easy to fill and simple to clean.It has a stainless steel pressure-relief valve, so I didn’t have to worry about blowing casings open, and that made the entire process go faster. It’s designed for commercial use, so I know that it will last for years. My only complaint with it is the high price, but it's worth it for a system that will plow through large piles of meat and withstand the ultimate test of time. The food-grade plastic piston is very easy to clean. The stainless steel surround just needs to be wiped down. The tall design takes up less counter space. It uses most of the meat and filling so that you waste less food. The pegs for the cylinder could be a little longer to make reassembly easier. All of these stuffers were of good quality and performed as expected, but the LEM Products 5 Pound Stainless Steel Vertical Sausage Stuffer really stood out from the competition. It has the metal gears and components that can easily be sterilized, and the design was simple to clean. I found the tilting canister to be a true asset when working with large amounts of meat, and it just plowed through everything without bogging down. It’s so easy to set up that I also don’t mind using it for smaller sessions, and the pressure-relief valve meant that I wasted less time and meat. It costs a little more than other models, but I feel that it’s worth the extra money for the excellent quality and smart design. If you’ve used some of these stuffers or you just want to share your thoughts on my review, please leave your comments in the section below. 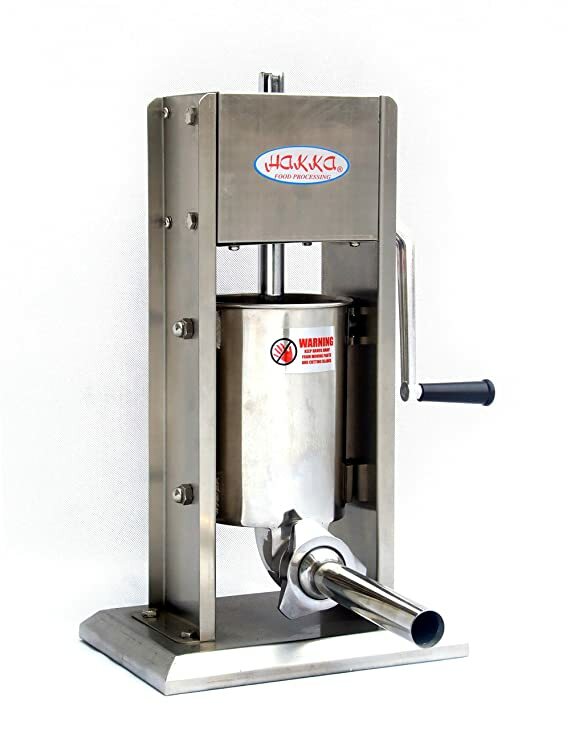 You can also share this piece with anyone who may be in the market for a new sausage stuffer. 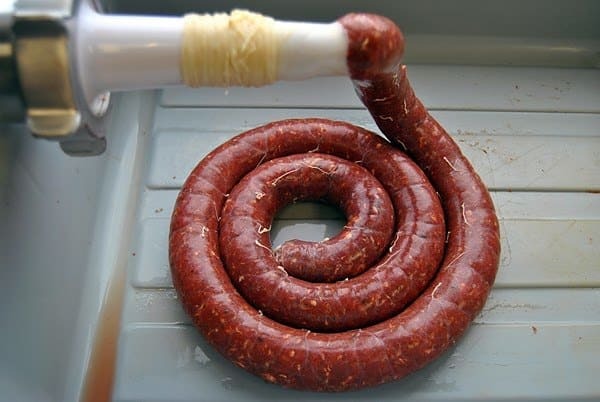 Learn more about our great sausage recipe with Best Way﻿ to Cook Polish﻿ Sausage & How to Avoid Wasting Pork by Making Hurka Sausage.